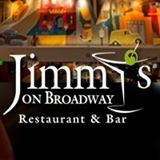 Located in the trendy Capitol Hill neighborhood, Jimmy's offers modern American cuisine, a hospitality spirited service staff and an energetic atmosphere. Our bar offers 22 draft beers on tap, local Washington wines, and an extensive back bar selection. Jimmy's serves breakfast 7 days a week, our all day menu features local ingredients, and happy hour is celebrated two times daily. Private dining spaces are available for groups up to 120. A local's gathering place where visitors always feel welcomed, Jimmy's is Capitol Hill's best kept secret.